« Goodbye my old friend, » I whispered, gently patting him on the shoulder and then stroking his sleeve. I could almost feel tears coming on. There was a brief moment of hesitation. « What if … » But I knew there was no going back. All the times I had saved him before, but this time even I had to admit that he was just too old, too grotty, he had to go and so I unceremoniously hurled him into the dumpster and walked off without looking back. We had been together 32 years, far longer than many married couples. We had done everything and been everywhere together, but there comes a time when it is time. Yes, this was the week that I finally threw out my leather biker’s jacket. Admittedly I hadn’t worn it for ages and for the last two years it had been sitting, festering away in a far flung corner of the attic where I had flung it in a fit of rage after my wife had tried to secretly get rid of it. « You can’t wear that, » she snapped one day, removing the offending article from the wardrobe. It was one of those « clearing out » days the sort of days that women love. Remorselessly going through cupboards with cold and scientific feminine, precision, throwing away that which was once loved and is no longer. « I can wear it when I sing with the band, » I protested, snatching away the offending and offensive article. 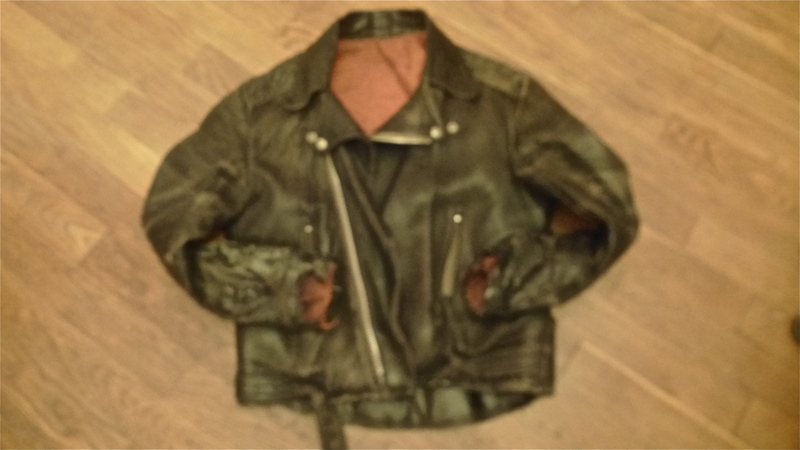 You can see that I was very attached to my old leather biker’s, despite the ripped lining, the holes in the elbows and the traces of mould on the sleeves, not to mention its smell – a fully matured, thirty two year sweat and nicotine stink. It was though an essential part of my life. I studied the jackets closely. They certainly weren’t rock and roll. I wanted to look like a Ramone and not a recently retired bank clerk. They’re awful mum. I want a biker’s jacket. There’s a great one down at the charity shop. I could see my mum physically recoiling at the idea of her carefully brought-up son wearing a grotty second hand leather jacket. I couldn’t quite understand her reaction. Was it the idea of the leather jacket, the charity shop or just the whole second hand thing? « Well, you got my school blazer from a charity shop » I reminded her. 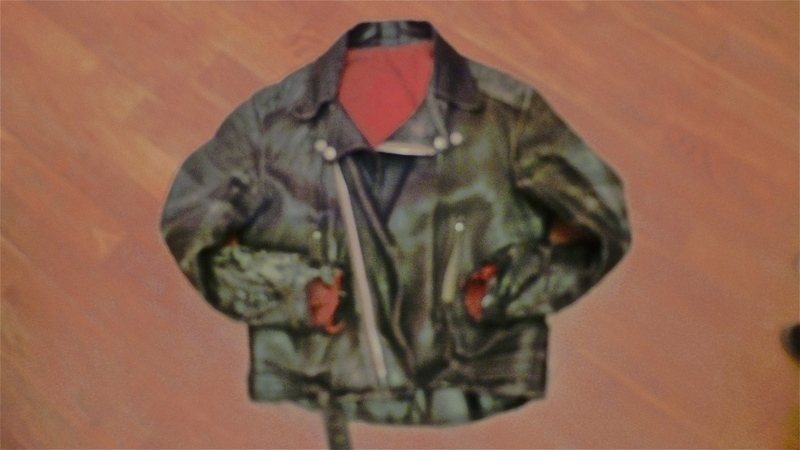 The leather jacket came as a subversive « fait accompli » in the midst of my sixteenth year. My fellow Metal Mate Graham C (universally known to everyone as Graz ») – who offered to « procure » me a leather jacket if I slipped him ten pounds – a lot of money back then- roughly the price of 12 packets of cigarettes – (these were the days when you could get a pack of twenty coffin nails for 75p.) Getting the money wasn’t much of a problem – I asked mum for ten pounds to buy a couple of LPs – Yeah, this is the paradox. Apart from my dubious leisure wear, I had been serious rock fan since the age of 14 – ever since the day that my mate Jason took me under hi swing and introduced me to Led Zeppelin. Like all kids of my age I had been getting into music, mostly chart stuff. My first musical acquisitions were a Lene Lovich album and a Specials album. My friend Jason though, appalled by my musical tastes, invited me round to his house one Saturday afternoon to hear some « real » music. Whilst his mum made us a cup of tea, he slapped Led Zep 2 in the turntable – I’ll always remember the first time I heard the opening chords of Whole Lotta Love. I was hooked. After Led Zep, I discovered Black Sabbath, then AC/DC and … I had the records, now I wanted the gear. Mum slipped me a tenner. I slipped the tenner to Graz, and a week later, as we stood smoking one break time behind the cricket pavilion at school, Graz officially presented me a partly scuffed, well-worn and reasonably scruffy leather jacket. « It’s a bit big » I said, the jacket absolutely engulfing me. Graz informed that the previous owner had been a rather large chap., and just as well, because his corpulence had prevented him from catching up with Graz as he made off with the jacket. « Call it a long-term loan » said Graz adding that I should never wear if I went drinking at a certain pub in downtown Croydon. How to get the jacket home? Well, that was easy. I kept it in my school locker for a few days, and then one day when I knew mum would be finishing late because of a staff meeting at her school, I shoved the jacket in my school bag, brought it home and then hung it at the back of my wardrobe. When the time was right, I wore the jacket in front of mum, saying that Graz had « given it to me because he doesn’t want it anymore. » (Erm not very credible.) That was how the jacket entered my life and from that day, I pretty much wore it for the rest of my life like a second skin. Winter, summer, rain or shine from my later school years, right through university, the jacket was never off my back until I reached my early 30’s, when, much to my chagrin, my wife announced that I was just a little too old to be dressing like a juvenile delinquent. And back to the present. I have shed my old second skin. It now lies at the bottom of a dumpster. So grotty had it become that I doubt, that even the scavengers that hang around the local dump and comb through the dumpsters around closing time would want it. Me and my jacket – 32 years of communal life. 5 girlfriends, countless gigs (including the Ramones), pubs, demonstrations, from Berlin to Barcelona, I’ve lived in this jacket, I’ve slept in it numerous times on all those long bus and train journeys across Europe and I suppose in my 49th year it really is time to move on, besides, I bought another biker’s jacket a couple of years ago. So, my old friend, I’m gonna miss you. Here’s hoping that you have gone to leather heaven where beer flows in rivers and the angels play screaming heavy metal guitar solos on celestial Gibsons and God looks like Joey Ramone. The moral of this story? I don’t know whether it is better to remain a perpetual teenager or just accept your age at any age and wear age appropriate clothing, which at my age means heading back to the likes of C&A and preparing for the great Beige binge. Posted in Ageing, Culture, Death, Fashion, Heritage, History, Life, Music, Smoking and tagged age appropriate, Charity shop, Graz, leather jacket, leather jackets, Rock and Roll. Bookmark the permalink.